Houston, TX (March 3, 2015): David Weekley Homes, the nation’s largest privately-held home builder, is proud to announce the opening of their latest model home in Larkin at Cottage Grove. The Riva features three bedrooms, three full baths, one half bath, a game room, fourth-floor terrace and a two-car garage within 2,600 square feet and four stories. The Riva is open for tours from 9 a.m. to 6 p.m. and includes such designer features as a wood flooring, a dark-wood built-in for the family room with insets for the TV and a fireplace, a second-story balcony, built-in wine cooler in the kitchen and a stand-alone tub in the owner’s bath. Located at T.C. Jester Blvd. and Larkin Street, just north of I-10, Larkin at Cottage Grove is a private, gated Central Living community with 68 homesites. Buyers can choose from seven three- and four-story floor plans, each with three bedrooms, three full baths and two-car garages. Some floor plans include one half bath. David Weekley began building in Central Houston in 2008, and has since built new homes in more than 30 communities in and around The Heights, Rice Military, the Galleria area, Washington, Montrose, Midtown, Garden Oaks and the Spring Branch area. 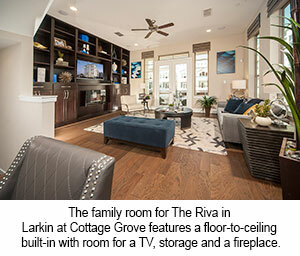 For more information about David Weekley Homes in Larkin at Cottage Grove, contact 832-535-2508. David Weekley Homes, founded in 1976, is headquartered in Houston and operates in 19 cities across the United States. David Weekley Homes was the first builder in the United States to be awarded the Triple Crown of American Home Building, an honor which includes “America’s Best Builder,” “National Housing Quality Award” and two-time recipient of “National Builder of the Year.” Weekley has also appeared eight times on FORTUNE magazine’s “100 Best Companies to Work For®” list. Since inception, David Weekley Homes has closed more than 75,000 homes. For more information about David Weekley Homes, visit the company’s website at www.davidweekleyhomes.com.